On the first day and first time being behind the wheel u don't know what to expect. You have so many questions going through your head. The main question is this person the instructor good and he/her going teach the right stuff or waste your time and be there for your money only. But however on my first lesson my instructor was very welcoming had me taught The basics and made me comfortable. He was always really patient and calm. Every lesson was productive there always something new to learn which was grateful. He had full come my fears and stuff I hated it. By going through my weaknesses over and over again until it was good enough. One thing I learnt from This experience is that "practice makes perfect". In result I wouldn't of been here and wouldn't of done it with out my instructor Khaled. Passed first time round with less than 6 months of lessons. which people hardly don't pass the first time round. Thank you Khaled. I definitely recommend flex driving school. Flex driving school is like no other! 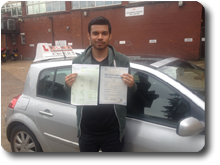 I passed first time with Alam, the best instructor around. He explains all manoeuvres in such a way that you understand them all without any complications. He has helped many people in my area pass either first or second time. Third time is not possible with such a great instructor. THANK YOU VERY MUCH ALAM!!!! 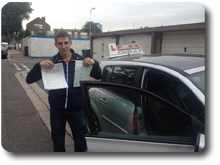 I would recommend Flex driving school to anyone who is determined to pass first time. Do not look any further. Give Flex a call today, it'll be the best decision you would ever make! My Instructor was Alam. 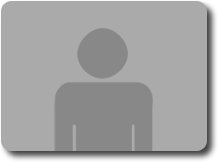 He is the best instructor I could�ve asked for. 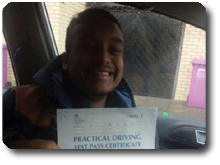 3 months ago I didn�t know the first thing about driving & now I have passed my test. All credit goes to him. He was very punctual & professional with flexible hours according to my demand. This was very helpful because I was doing this beside my fulltime job. Just to say, thank you Alam, you are an excellent instructor. Failled my test 3 Times...I give up. Bad Experience. Driving for me was tricky at first but with a little help and guidance i found it easier to prepare, observe and be an overall safe driver. Where i had initially made my mistakes my instructor went back to the same places to correct my faults. As time went by i had to drive more independently and use my common sense and follow signs in order to prepare me for my practical. Overall I am happy with how i was taught and learnt from my instructor Ash. Having driven for over ten years in the United States and picking up bad habits I was worried about taking my driving test in the UK. 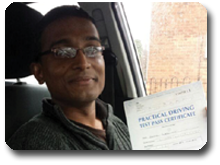 I am glad I chose Flex Driving School, and in particular my instructor Ash, to help me adapt my driving style to the UK's unique roads and roundabouts. 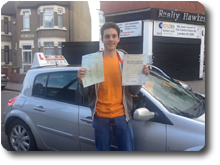 With their help I was able to pass with only a few minor faults. Thanks Flex! Ash was my instructor. I had more than 30 driving lessons with him, he pointed out all the bad and good points about my driving that helped me to concentrate more on bad. In every single lesson i got something out of it I suppose this helped me to pass my test on my first go, even though I was stressing during my practical test I knew the area so I knew what to expect The date I passed my test: 01.10.13. I was taught by both Khalid and Alam. I was an incredibly nervous driver and had already failed 3 times under BSM the previous year. They were both incredibly calm and patient teachers, flexible with their time to help me pass and great teachers happy to go over the basics until I could drive and do manouevres instinctively. Alam realised early on that my nerves under test conditions was my failing point and ran multiple mock tests with me!! Khalid is a Brilliant Instructor. Am happy to have chosen him as my instructor. Being a complete amateur in the driving arena, where i had no clue of what the Clutch really does and top it up with immense nervousness, Khalid helped me build my confidence and kill the road fear. He was always very patient while explaining and helping me improve my driving skills. He never rushed me into different aspects and ensured that am ready for the test. 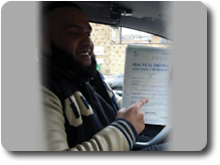 I passed my test first attempt which is complete credit to his teaching and instructions. 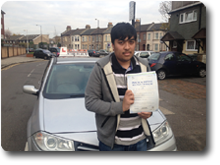 I will recommend him especially to the first time learners, you can confident you will get through.Thanks Khalid!! My instructor was Ash, best instructor in my opinion. very reliable and flexible with appointments. he gave me a in depth understanding of both practical and theory and was generally good at spotting my mistakes and building up my confidence in my points of weakness. I would recommend Ash to anyone who is studying or has a busy lifestyle. he will work around your schedule and wont let you get away with mistakes. sign up people! 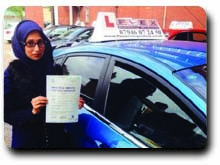 Excellent service given to me by Flex driving school. One thing I must mention about my instructor, he was always on time, never late. I hate waiting and I like to do things on time. but thankfully that was the case with Flex. absolutly number 1. I passed my test second time. Your feedback will help us to improve our service. We do not pass on your details to any third parties without your consent. All data submitted is kept secure and safe. Your email will not be published on the website .